With their defeat in the American War of Independence the British lost the use of the ports of its former colonies. To compensate work began in 1809 at Bermuda’s Ireland Island on the construction of the ‘Gibraltar of the West’, the Royal Naval Dockyard. The work was carried out using both slaves and convicts shipped from England. Of 9,000 convicts put to work here, approximately 2,000 perished during construction, many from yellow fever. The Royal Naval Dockyard remained a major Atlantic outpost for the British Royal Navy until 1951, when most of the facility was closed. A limited number of buildings and facilities remained opened for the support of British and NATO ships until complete closure in 1995. 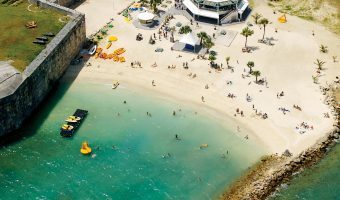 Since then the location has been transformed into one of Bermuda’s most popular tourist areas and is the major port of call for cruise ships visiting the island. 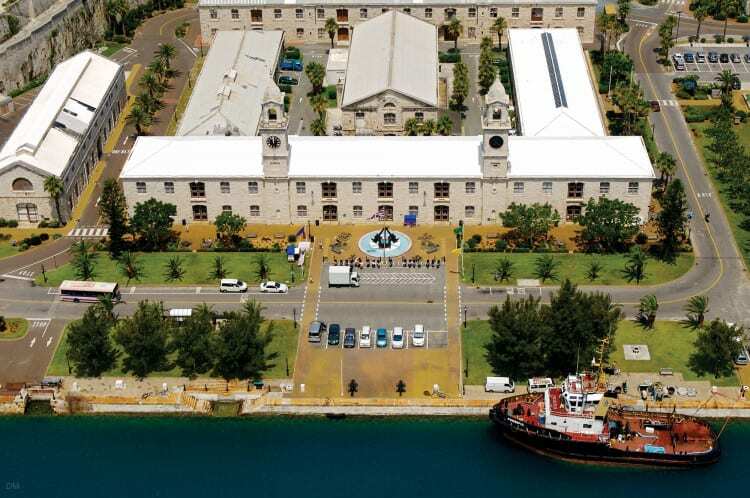 King’s Wharf and Heritage Wharf are two adjacent cruise ship terminals at the Royal Naval Dockyard. They are the only docks in Bermuda capable of handling today’s larger vessels. All the regular, contracted cruise ships visiting the island now dock here. They depart from New York, Baltimore, and Boston. The docks at Hamilton and St George are currently only used by smaller, occasional callers. The historic buildings of Dockyard would be worthy tourist attractions on their own, but many have been given a new lease of life by WEDCO. The Keep, a stronghold at the tip of Dockyard, is now the National Museum of Bermuda. It’s dominated by Commissioner’s House, a restored building housing exhibits exploring over 500 years of local history and culture. Dolphin Quest is also here and offers visitors the chance to swim and interact with dolphins. The Cooperage is directly opposite the museum and was used for making barrels. It now houses the Bermuda Craft Market, the Bermuda Arts Centre, and the Neptune Cinema. Snorkel Park lies just west of the museum and is Dockyard’s only beach. Next to it you’ll find Bermuda Fun Golf, an mini-golf course with 18 holes replicating some of the most famous courses in Bermuda, the US, and Scotland. A row of buildings running along the north-western perimeter of Dockyard were previously used as workshops and stores. They now house a variety of businesses such as Dockyard Glassworks, the Bermuda Rum Cake Company, the Bermuda Clayworks, the Dockyard Pharmacy and Makin’ Waves. The Great Eastern Storehouse is now the Clocktower Mall, a shopping centre with a good selection of small stores and galleries. It’s located near the main entrance to Dockyard. The Frog & Onion Pub takes its name from two former owners and is situated at the Cooperage. It offers pub grub and serves beers from its own microbrewery. Italian chef Livio Ferigo runs two restaurants at Dockyard; Café Amici at the Clocktower Mall and the Bone Fish Bar and Grill near the ferry terminal/cruise ship terminals. Other places to eat and drink at Dockyard include the Freeport Seafood Restaurant, the Dockyard Pastry Shop, and Hammerheads at Snorkel Park Beach. Throughout the summer Dockyard is packed with thousands of cruise ship passengers. Many of the island’s activity and tour providers are based here and offer visitors a wide array of things to do. KS Watersports offer jet ski tours, parasailing, and a high speed boat trip around the island while Hartley’s Undersea Walk offers visitors a unique underwater adventure. The Island Tour Centre/Fantasea Bermuda offers scuba diving and snorkelling trips, kayak tours, fishing trips, and more. For a unique guided tour of the Dockyard area try Segway Tours of Bermuda. Destination Dockyard is held every Monday evening throughout the summer months. The street festival features live music, Gombey dancers, food vendors and more. Other events include historical re-enactments in the Victualling Yard, salsa dancing and live entertainment at the Bone Fish Bar and Grill, and the nightly parties at Snorkel Park Beach. Getting around Dockyard on foot is pretty easy. It’s fairly flat and you can walk from one end to the other in about 10 minutes. Visitors that prefer not to walk can take the free shuttle bus. It travels a circular route around the area stopping at the cruise ship terminals and all major attractions and points of interest. It runs daily from 8.30 am until 6 pm. 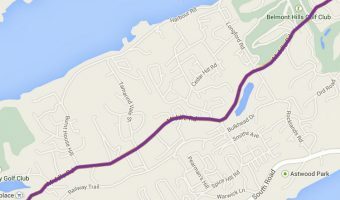 Bus number 7 and bus number 8 run between Hamilton and Royal Naval Dockyard. Bus number 7 is the most popular with tourists. It runs along the South Road and stops at many of the island’s best beaches including Church Bay, Horseshoe Bay, Jobson’s Cove, Warwick Long Bay, and Elbow Beach. Dockyard is also served by the island’s excellent ferry service. Throughout the year there’s a regular service to Hamilton. There’s also a seasonal service to St George. Visitors planning on doing a lot of travel on public transport can save money by purchasing a transportation pass. Holders are entitled to unlimited travel on buses and ferries. 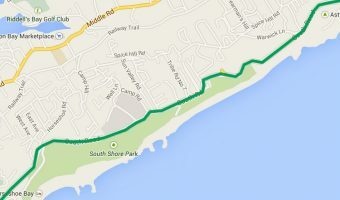 Those wishing to see the whole of the island at their own pace should consider hiring a scooter. Oleander Cycles are one of the island’s major rental companies and have a branch at Dockyard. There are three Visitor Information Centres at Dockyard. The main one is situated on the Dockyard Terrace near the ferry terminal. There are also centres at Kings Wharf and Heritage Wharf that open when cruise ships are in port. Each sells ticket and passes for buses and ferries and can provide general tourist information. ATMs are located at the Cooperage (near the Frog & Onion) and in the Clocktower Mall. Internet access is available from local telecommunications company TeleBermuda International (TBI). They recently turned the whole of Dockyard into a WiFi hotspot. It’s not free but is cheaper than the internet service provided by the cruise ships. To connect simply search for the TBI network on your WiFi enabled device and then open your web browser for the sign-up page. Interactive map of Royal Naval Dockyard. Click on any icon for further information. Why no free web cam on this site showing the beauty of the port and cruise ships? Not to mention the great weather ! Are the ferries wheelchair accessible? This doesn’t look inviting if you are looking for sandy white beaches of Bermuda. This area is where the cruise ships dock. It is also an important historical site and most of the buildings have been converted to serve cruise ship passengers. It is interesting to look around and quite a large area. If you want to see everything it will take the best part of a full day. I thought some of the items for sale in the mall could be a little bit more authentic. A lot seemed like items mass produced for the tourist market and not authentic Bermuda goods. A new pirate-themed bar has opened at Royal Naval Dockyard. Calico Jack’s is former Bermuda ferry that has been converted to resemble a pirate ship. The ship can hold approximately 200 people and boasts a full sound system. 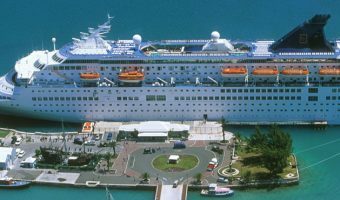 The ship is moored close to the cruise terminals and is expected to be a big hit with cruise passengers. 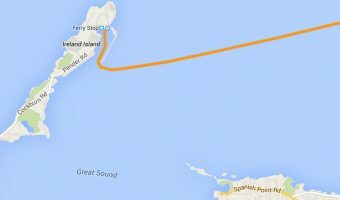 Which is the closest beach to Royal Naval Dockyard? See the FAQS for the answer. There is a beach right at the Royal Naval Dockyard. It’s called Snorkel Park Beach and is only a short walk from where the ship docks. It’s fairly small and probably is not the nicest beach in Bermuda but it is the most convenient. 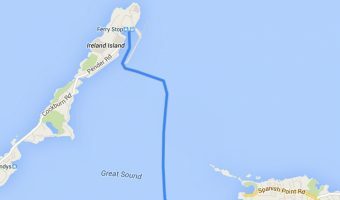 There are other beaches of course, but you have to take the island’s transportation system to reach them. Cruise ship schedules for the current and previous years.